Tami Simon: You’re listening to Insights at the Edge. Today, my guest is Loch Kelly. Loch is a meditation teacher, psychotherapist, author, and founder of the Open-Hearted Awareness Institute. A graduate of Columbia University, Loch was awarded a fellowship to study forms of nondual meditation in Sri Lanka and Nepal from 1981 to 1982. Loch also spent ten years establishing homeless shelters, community lunch programs, and working in a community mental health clinic in Brooklyn. He also serves as coordinator of counseling at Union Theological Seminary, and has worked extensively with families of 9/11 victims. As a licensed psychotherapist, Loch has been teaching seminars and practicing awareness psychotherapy in New York City for 25 years. He has also collaborated with neuroscientists at Yale, the University of Pennsylvania, and NYU to study awareness training’s effects on enhancing compassion and well-being. 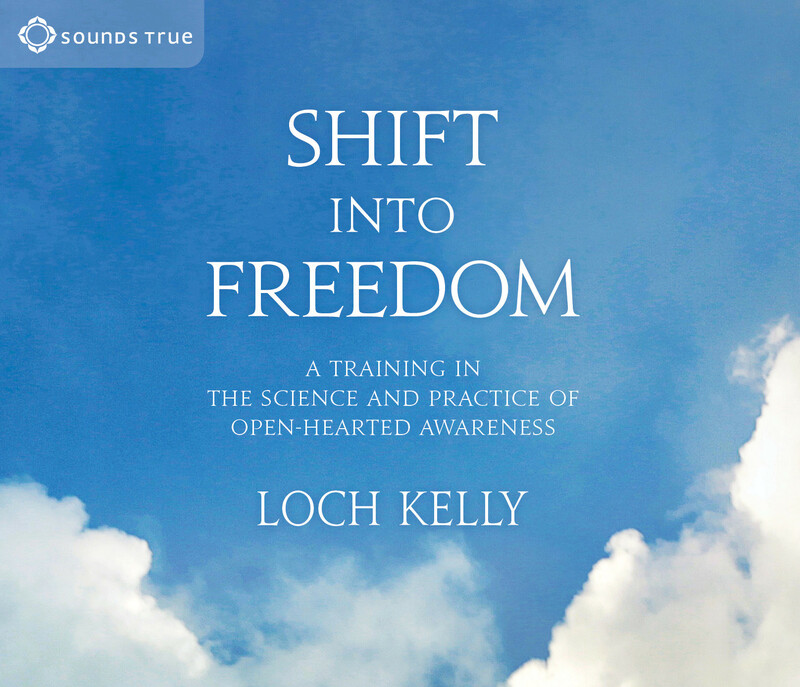 With Sounds True, Loch Kelly has just released a new book and a companion audio series entitled Shift into Freedom: The Science and Practice of Open-Hearted Awareness. Loch, your new book is packed with—I guess one could call it “techniques” for spiritual awakening. One might even say that your book, Shift into Freedom, is an awakening curriculum. I’m curious: right here, to begin our conversation, do you really think that spiritual awakening can be taught through a type of curriculum, if you will? Loch Kelly: Yes, thank you so much, Tami. It’s great to talk to you. Great to be here. I would say that the book is a written attempt to create a context or outline of view that houses a series of pointers. I would call them more than techniques, because in some ways “techniques”—to me—has the feeling of somebody doing something to achieve some state. In some ways, these pointers, or “small glimpses,” are really ways of untying knots or un-hypnotizing ourselves from the techniques that we do consciously and unconsciously every day, [which] kind of create a sense of being who we are. So, if awakening is returning to our natural condition—which is already here for each of us—then it is an undoing and a returning home, and a way of discovering and uncovering a natural condition which—when it becomes primary—seems to maintain itself in a very natural way. So, there is an unlearning—an unlearning program, maybe. TS: OK. Well, I can go with that. “An unlearning curriculum of pointers.” What would you say is—if you will—the core of this unlearning that you’re pointing to? LK: So, I would say that the core of unlearning is a particular pattern of a sense of self that I have been curious about from early on in my own experience in life—and also, then, in reading different texts from spirituality and psychology, from wisdom traditions around the world. [They] are pointing at something about this sense of there being a separate sense of self that is not other than our personality. It’s not that we’re getting rid of our ego-personality or ego-body or our ego functioning. There’s actually a small, looping pattern of self-referencing thought that seems to start early in childhood as an important function as what’s called in psychology—interestingly—self-awareness, which means that thinking can become aware of thinking. What seems to happen is that self-awareness process creates a second sense of self within our bodies and it kind of co-opts the programs of the body’s boundaries. So, it starts to feel as if there actually is a location of this thought-based identity that we can’t even see because we’re listening from it right now and we’re looking out of it. It’s become so familiar that it seems normal, but it actually is just like a body—as if it has a body. It’s looking for satisfaction and it’s looking for safety, but it can’t find any food or anything to satisfy it because it’s not physical. There’s nothing that threatens it, because it’s not a physical thing that could be threatened. LK: Well, it’s a lot like senses. In trying to make sense of all this, I kind of tried to find a way to make sense of it. Rather than trying to say it’s a false self or it’s bad, I see it almost as a developmental process—and that now we have the potential to grow beyond, into the next natural stage of development, which is based in awakening from this. [This is not] only awakening from, but awakening to an awareness-based way of knowing that’s actually already available. It just needs to be rewired so that we can function from it—so that it’s part of the unlearning and then retraining. TS: Talk some about the rewiring process. That’s very interesting to me. I know that you draw a lot in your new book, Shift into Freedom, on science and neuroscience. What do we know now about what’s required for this type of rewiring to take place? LK: Yes. So, we know so much about [it], there’s so much great research—particularly about some of the early stages of meditation [and] some of the one-pointedness and deliberate mindfulness practices as a way of relieving stress. Now, there’s even some more studies about resiliency, studies about compassion, and how the brain changes—and how that’s part of the embodying process. Awakening is not an escape from the world, but it is actually a way to inhabit our human life in a way that we can actually become more intimate, relational, and creative. To do that, some of our conditioning and some of our stronger, faster-moving patterns of instinct and thought begin to be rewired or—just as we learn [that] our brain has more plasticity than we believed was possible 20 years ago, even. Brain scientists didn’t believe the brain changed much after seven, and we know that is not so. The brain is really our body. It’s not like our body and our brain. Our brain part of our body; our body is part of our brain. So, I think it would be very important to hear more about this. But eventually, I was able to find people who would talk about it and discuss the kind stages—not just of the initial awakening, but being—in one system of Mahamudra, they talk about the initial recognition, which is that glimpse. The second stage is called “realization,” where you move from it being an experience to realizing that that’s actually who you are, and everything else that’s happening is the experience. So, it becomes your ground or fundamental nature—fundamental identity—and you feel that. That’s palpable and perceptible. That comes and goes, and you shift back and forth until that’s more primary and that’s starting to be stable. Then you start to express—”expression” is the fourth stage—and you start to express. You’re in the walk and talk. Your emotional life is experienced from there. So, in some ways, that second shift is really the key. It’s from recognition—which is temporary meditation experiences or small glimpses—to realization and [the] beginning of stabilization. This is—I believe—very possible, and is what my book is about. It’s trying to say, “This will not take any more time or effort than learning any other meditation practice.” But, it is starting at a point where many meditation practices stop or stay. TS: Well, let’s take this step by step here. So, I like [these] four steps that you’ve offered. To begin with, let’s just cover the ground of recognition clearly for people. Tell me what you mean by that. LK: So, “recognition” is this recognition of—I would say—the absence and presence. So, the absence of a sense of ego-centered or ego-identified point of view. So, when you actually have shifted out of the way of perceiving that is actually looking out of your eyes—probably like now, because it is the usual way of organizing identity. So, when that drops away or your shift out of that, then you can recognize a kind of not-knowing as a first step. But, then the real beginning of full recognition or a glimpse is you recognize that what is here is already aware—that there’s an intelligence or an awareness that’s non-conceptually fully on, like a light bulb. But, you’re not doing it. You’re now actually looking from that—or, that’s where you’re located. It’s that shift that you can actually feel fairly quickly. As soon as you learn, you have to learn it for yourself. Nobody else can. They can point it out—which is what this book and this audio series is about. It’s about pointers, which are like experiments. TS: OK. So, the recognition of—we could say—awareness as already present, and starting to experience from an awareness-centric way of being. Or, awareness is what’s here and everything’s arising within awareness. OK. Then, the move from recognition to realization. People can do that right now at home. Just ask yourself that. I lead in with a couple of different pointers to differentiate thoughts and awareness, and have a sense of that movement. Then, that would be that kind of inquiry that people have to do for themselves. TS: So, it seems like one of the really critical knowings here is how to distinguish thinking from awareness—that that’s really kind of a basic building block. TS: That’s required. So, if someone’s listening and they’re not a hundred percent sure that they get that—how to make that distinction—how can you help them? LK: There’s a bunch of little pointers. It would depend on the person or setting up the context or the time. We could do a little pointer here, if you like. LK: Does that sound good? LK: OK. All right. Let me just see which one. There’s about five or six just toward that, which is [the] early sense. So, what you do is just simply—even as you’re listening, you can kind of half do it with me. You’re going to repeat a word slowly in your mind. When you repeat the word, the word is going to occupy conceptual thinking, because it’s made of thought. Between the words, you’ll notice space. Then, eventually, I’ll point you to notice that that space is aware. One of the words that’s kind of fun to use—that you can begin to repeat in your mind—is “blah.” So, if you just say, “Blah,” and really be aware of that as a thought. “Blah,” and then be aware of space. “Blah,” space. “Blah”—kind of floating through space. “Blah,” space. Now, notice the thought. Be aware of the thought. Be aware of the space. Be aware from the space of the thought. Notice that the thought can be there—or not—and yet, you’re aware without needing to think about being aware. TS: So, that’s helpful, Loch. Now, I want to circle back to something you said, because you talked about how—at a certain point—a shift happens and we’re no longer moving from thinking to space, if you will. But, we’re living in this—you call it “open-hearted awareness,” which is a beautiful way to describe this sense of big space. We’re living in this big space and thoughts are occurring within it. So, how does that shift happen—where our locus of identity, if you will, is in space versus [us] journeying there through pointers like this? LK: Yes. Well, again, as pointers through the whole process. The first shift is from thought-based to space. Then, aware from space. But, then the next two shifts are really—the more important one is that once you realize that awareness is aware by itself, then the next move is to become aware that your body and energy is none other than awareness—that awareness is arising out. So, there’s a stepping-out, a transcending, and then an incarnation—including opening, aware from space, observing from space. Then spacious awareness is already discovered to be inherent within your body. So, you completely feel embodied from within, head to toe—heart-based. Then the next movement is that you realize the heart-mind is relational. The heart-mind is interconnected with others and the world. There’s a sense of being not only awareness-based and embodied, but interconnected. That’s the fourth or fifth movement, called “open-hearted awareness.” It’s actually relational—unconditional, loving-based—awareness that can deal with emotions [and] thoughts, and is conscious. From awareness base, you’re moving through your day and anyplace you live. TS: OK, but I’m going to ask more questions about this “stabilization,” if you will. That’s because I’ve met so many people who seem to have deep experiences—if you will—of this spaciousness. But, certainly when you get close to them and you start grilling or poking around or things get really stressful or something difficult happens, they don’t seem very stabilized once you get up close. So, help me understand that. How many people are really living in this stabilized state of open-hearted awareness? LK: Well, I would say in terms of the tipping point of moving toward realization—and in some ways, stabilizing is moment-to-moment changeable. There’s nothing stable-stable. But, the primacy of awareness—which is empty and is now recognizing itself as the aliveness and appearance. So, that sense of that being the day-to-day operating system, really. In the training, [we have] small glimpses many times. You kind of go back to getting caught in what I call “System One,” conceptual thinking. Then you simply learn in this process to unhook, drop, open, be aware from space, be embodied presence, and then open-hearted awareness—in that ability to return and navigate fairly quickly your entire sense of consciousness and then just let go into beginner’s mind. I’d say there’s many, many people like that—hundreds of people in that dance—who have kind of crossed the line from being the meditator to being embodied presence. [This] is really the key. I think what you said is that a lot of people have experiences of spaciousness. That’s kind of a transcendence. That, in some ways, is still a meditative experience. It’s not quite a human experience. It’s transpersonal. The loose word we’re using, “stabilizing,” is the translation of a word [that] begins with presence or what’s called “simultaneous mind,” which is the ability to be both spacious—everywhere, nowhere—and very much here. That’s happening by itself. You’re not doing that. You’ve kind of uncovered that—and I think it’s notable and teachable and trainable. [It’s] just as easy as—you know the people I’ve spent time teaching mindfulness? Some of the people I’ve spent time teaching this to take—it doesn’t seem to be more of a difficult learning process or to take more time. It’s worlds of difference. TS: Well, yes. That’s very, very interesting—what you’re saying. For our listeners, will you define what you mean by mindfulness and how you’re using that term? How [is it] different than the approach you’re offering here? Could this become as popular as mindfulness? Wouldn’t that be amazing? But anyway: First, just what’s the distinction? LK: That’s the idea. I’m hoping, and think it could be the next wave, because that’s where mindfulness as a basic, early practice—or beginning practice—is pointing to awakening. All the traditions, right? My teacher, who I met early on in Nepal—Tulku Urgyen Rinpoche—he talked about [how] there’s two kinds of mindfulness: deliberate mindfulness and effortless mindfulness. So, deliberate mindfulness is what we know. You intentionally are using attention, focusing from your moving mind—from your everyday mind, which is moving—trying to calm it and focus it by using some one-pointed technique. There’s other things that are like that. Chanting, mantra—other things that are one-pointed. Looking at a candle. [One does this] in order to calm the everyday mind, and then you move into either subtle body or subtle mind. Subtle mind is the meditator mindfulness that is aware of [one’s] internal contents, of consciousness coming and going. So, that creates a meditator. You’re able to watch and realize you’re not your thoughts. So, you realize who you’re not. Then, the next move I’m talking about—effortless mindfulness—you have awareness look back through the meditator. So, you practically pop the meditator, opening it up beyond that point of view, to discover an awareness that’s already aware—that’s not deliberately, through a doer, aware. But, you join with it, you discover that it’s always been your primary awareness. That awareness is now aware in the same way as Vipassana observing awareness. But, it’s also observing from within your body. It’s not observing from a detached witness. You’re inhabited [and] aware both inside and out. There’s a kind of surrendered quality. You’re connected to your heart-mind, which is [the] non-conceptual basis of intelligence rather than a meditator, which is more subtle mind—or doing mindfulness from your everyday mind, like eating food or something like that, which is often done from your moving mind. TS: Can you help me understand more about the “effortless” part? That sounds very attractive to me. How do I approach this with effortlessness? LK: So, in some ways, “effortless” isn’t a description of “make no initial effort.” It isn’t describing you don’t have to make an effort. You do have to—as I wrote a book with a lot of little pointers and glimpses. Sometimes, the word anupaya is like a small—it’s not no effort, but it’s a small initial effort of letting go, turning over, discovering—what I call “unhooking awareness from thought”—and having it move to your ear. Be aware of sound at your ear. Then, opening to discover the space all around, which is already aware. So, it’s a surrender and an unhooking and a looking until you join or pass the baton of awareness to an awareness that is effortlessly aware already. So, that’s the effortless—there’s something that’s effortlessly aware already. It’s what people who operate in the flow state know very well. So, it isn’t a meditative state. Many of the practices—most of the practices—that I do are open-eyed, and they’re meant to immediately take you into a functional flow state. You’re not monitoring or self-reflecting all the time on what you’re about to do. [It’s] like a trust in a natural intelligence. TS: So, we could say that one way to describe this new operating system that you’re pointing to is a highly functional flow state? LK: Yes. I think that’s a good piece of the pie. I have a chapter that deals exactly with that—that talks about adaptive unconscious and Csikszentmihalyi’s flow state. It’s a good transition piece, and it gives people a self-sense because many people do know what a flow state is. They know that you’re not thought-based, and yet you’re highly functional. They often talk about people having to do 10,000 hours of training as a violinist or as a rock climber or even knitting, [with] other things to train the conceptual mind and the memory to be onboard—and then they can enter a flow state. Or a basketball player or somebody else like that, right? LK: Well, my contention is that we have done 10,000 hours of walking, talking, thinking, relating to others, and that there’s no reason why shifting into this awareness-based knowing—embodied knowing—those things can’t come online just like other people have trained in certain skills. That’s what I’ve been finding. TS: Now, you mentioned a couple of times this idea of “unhooking.” I think that’s a very interesting pointer, if you will. I wonder if you can take us through that. How do we unhook? What do you mean by that? LK: Yes. That’s one of the main, interesting approaches that I’ve focused on and kind of emphasized. It’s not the only way to do it, but I kind of divide the main roads to awakening as kind of the resting methods and the looking methods. So, the resting methods are most of the meditation methods of just sitting—shikantaza—mindfulness. So, you’re sitting, resting, letting everything settle, calming the mind, and letting awake awareness appear from the background. So, I focus more on the looking method, which is unhooking of local awareness and turning it around. [In Tibetan,] the word “recognition” is translated by A phrase, which means “looking at your own face.” So, what is looking at your own face? Well, it’s not your eyes. What it is, is awareness that is already here, but is inherent within you. So, because awareness seems obscured in its pure form, but it’s also inherent within everything. So, it can kind of unhook from thinking and drop either first into your body or go to one of your senses, and then open to return to—even though it never left—the awareness or recognize the awareness it is already part of. So, we could do it right now. We could do a little—want to do a little—? TS: Yes! Let’s do it. LK: OK. So, this is a little play shop. Just to get a feel for what this is like. So, awareness is the ground and the most subtle dimension of consciousness. I call it awake awareness just to distinguish it from attention. So, awareness is identified or attached to thinking. What if you just move—as you’re listening now, you’re listening to my words and thinking about them. So, just let awareness unhook from thinking and move to seeing. So, just awareness and seeing. So, just seeing. Neither seer nor seen—just seeing. Just as awareness can unhook from seeing, notice the big shift when awareness unhooks from seeing and moves to one of your ears—awareness of hearing. So, you didn’t change your eyes or your ears, but there is a huge shift in experience. Is that right? LK: Yes. So, all that is, is the movement of awareness. Now, there’s that awareness which we just shifted from seeing to one small area at one of your ears. So, it becomes aware, as if it’s knowing directly from that small area of vibration, sensation. One of your ears, right? So, you can focus on a small area. What is it like if that awareness that can focus opens to be interested in the space outside of your ear, in which sound is coming and going? So, let awareness open to boundless space—to the space in the room—and just be interested not just in what’s moving—and let that awareness mingle with space until it discovers that not only is it aware of space, but spacious awareness. That space is aware of itself. Or, you could have awareness go open to one of the walls on the side and then do like a swimmer’s turn, and then be aware from awareness back to and through your body. So, there’s a spacious and pervasive sense of connection to what’s happening within your body that’s pervasive as well as spacious. You can feel from head to toe that awareness is knowing your body and knowing equally inside and out of your internal experience and external—which is awareness-based. So, it’s feeling your body from within. But, it’s not one of the senses. It’s knowing and feeling awareness outside. Once you balance the inside and outside—so there’s not a going back and forth—one of the parts of your brain, the default mode network, actually unifies. It calms your daydreaming mind. TS: Now, can you help me understand that? What you mean by the default mode network? LK: —the next point. But, did you have a sense of that? What that was? TS: Yes, I did. Yes. LK: That feeling of what I call local awareness, [which] moves to spacious awareness. Spacious awareness is aware, then spacious awareness moves to embodied awareness. Then embodied awareness is able to be open-hearted—know from your heart-mind. So, when awareness comes back to your body below your neck, you can begin to know without going up to thought or looking down from thought. Do you have a sense of that? So, awareness opens and is the ground of awareness. It comes back or is already naturally pervasive and continuous. Then, if you don’t go up to look to thought or you don’t look down from thought, what are you aware of? What’s the knowing quality? What do you know? What’s knowing like? TS: Yes. That, to me, is taking us to a sense of being. So, the process unhooked from thought and then eventually we got to this place of resting in being. LK: Resting in being. The being has a kind of knowing. Did you notice that? LK: A non-conceptual knowing. It’s embodied. Yes? LK: You feel your body from within? And you may feel some kind of connection to people or things in the room, or the environment. Like a boundlessness, a little bit. An interconnectedness. LK: Yes. So, this is the ground. This is the shift in those few minutes. Now, the work becomes—the word in Tibetan for meditation is “familiarizing.” So, familiarize with this: don’t go up to thought; don’t go down to sleep. Almost like you have a little balloon in water, where the door of your heart is. Just kind of stay there. Just like nice, heart desire to stay, but “stay” means let everything go. Then, being is getting to know itself as itself and as it’s interconnected. So, the longer you remain and inquire and are curious—which is the quality of intelligence of heart-mind, open-hearted awareness. A little love, a little bliss. Do you feel that? TS: I’m with you, Loch. LK: [Laughs.] Right? I don’t call this meditating. I call this “marinating.” We’re marinating. This is the rewiring—it begins with marinating. So, you’re marinating, familiarizing, abiding. Don’t go up. Don’t be too strong, but don’t be too passive. That’s the other thing. I think a lot of people get a little—when you get to being, just because you don’t have to do anything to be doesn’t mean being can’t be curious. Just that little self-knowing and knowing. Exploring. Right. You feel that? Kind of little interest. Heart’s desire to stay, but not too strong. Not too sleepy. The realization is: is this experience happening to you, or have you discovered you—meaning the ground of being—to which now thoughts, feelings, and emotions are welcome? LK: Yes. So, I hate to go there, because we were just in such luscious territory there. I hope people who are listening won’t get too—you can read about it in the book. It’s meant for a book. But basically, the default mode network is a natural, unconscious rhythm that alternates going outside and going inside. It looks out, it looks in. It looks out, it looks in. So, when you try to meditate and your mind wanders, that’s the default mode taking you out into daydream. The study that they did at Harvard where they gave 2,000 students a beeper and asked them, “Are you on task or [is your] mind wandering? If your mind [is] wandering, are you happy or unhappy?” Fifty percent of the time they were mind-wandering even if they were trying to be on task and 90 percent of the time they were unhappy. But, they were in the default mode, which is what—and the default mode is that alternating rhythm of the brain. What I’ve found is that when you’re aware both inside and outside from awake awareness—from embodied awake awareness—your default mode gets balanced. So, now you’re able to both think without getting caught without thought [and] you’re able to relate. You feel this simplicity and interconnectivity and lusciousness and buoyancy—like ocean and wave kind of feeling. There’s an ocean of being and you’re a wave. So, you’re a particular person. You have a sense of humor, you’re able to relate, you can communicate—but you’re not getting caught in this distraction. You can effortlessly concentrate from here when you’re balanced. You can focus on something. I don’t know if you notice that right now—if you just look at something, you don’t have to use attention. You’re actually using local awareness to focus. Then, you can change focus to somewhere else. TS: I want to make sure I understand what you mean by “local awareness” compared to “awake awareness” or “spacious awareness.” Those are a lot of different kinds of awareness. LK: Yes, there’s four. I distinguish four—or five, I guess. Yes. TS: And can you briefly tell me what these different types of awareness are? So, what is that that can turn around and know? It can only be itself. What I found was it was like a wave of awareness that has intentionality. That local awareness is able to unhook from thought and return to itself as spacious, awake awareness—which is timeless, boundless. So, spacious awake awareness is the ground—infinite, timeless, boundless, content-less, thought-free. But, then spacious awareness becomes embodied awareness or presence. Then, [it] becomes open-hearted awareness, which is relational and has a heart-mind as intention. So, that which can move and unhook, and starts this awareness inquiry or this awareness pointing-within process is this feeling of what moved from being identified with thinking, moved to seeing, moved to hearing, and it moved to space. So, did you get a sense of that? TS: Yes, yes. So, you’re using local awareness to bring us, if you will, to spacious awareness? LK: Yes. It’s like the tuner or the vehicle. Because it’s already inherent within, it’s already there. So, it’s kind of a paradoxical dance of moving. But, it can detach and it’s the only quality that can actually recognize or know awake awareness. So, we try to use attention or even mindful attention—or mindful awareness for the meditator. They can’t know awareness. You can’t remain as the meditator and know awareness. You can’t use your attention—you know, bring your attention to your hand. Now I’m losing my attention. Now I’m bringing my attention back. That is another function. It’s a function of the small mind—of the everyday mind. So, you have to discover awareness that can know awareness. Either you do it by resting or by using this local awareness dimension of itself. Once you get a feel for it, it’s fairly easy. It’s what makes this whole thing learnable and easy to navigate your entire consciousness. Once you get a feel for it, you can navigate and you can do these small glimpses. TS: You know, through the course of this conversation, you’ve referenced a couple of times Mahamudra teachings and your work with the Tibetan teacher Tulku Urgyen Rinpoche. These are usually considered very advanced practices for people who have done a lot of meditation and higher levels of initiation are required, et cetera. Yet, you’re talking about connecting to local awareness [and] local awareness bringing you to spacious awareness kind of like scrambling an egg in the morning, if you will. Not exactly, but kind of like that. Go in the kitchen, get the egg. That’s very interesting. LK: Or sit down, meditate, watch your breath. Just like that. So, why would that be different? So, certainly if you look at Alan Wallace—his book on the nine stages of Tibetan intentional elements. It says the seventh stage is awareness, and the texts say that you can—for those who feel it’s easier—you can start from here. So, there’s all sorts of places. It’s only qualified by if you’re a certain type of learner. So, even rainbow painting—Tulku Urgyen says you can start with deliberate mindfulness or effortless mindfulness. But, it might be easier for you—if you don’t find it easy—to start here. So, it’s there. Certainly, it’s not my only tradition. I have teachers from Taoism. My colleague Adyashanti is certainly doing the same modernizing of the same traditions. He’s doing more of the resting method. But, basically, [he was talking] exactly the same possibility and ease. I don’t see the dangers that are described are often of the vajrayana energy practices—not of the recognition. Except maybe you become prideful. But, we’ve seen plenty of people who are prideful of a lot less. It’s not that you’re getting more prideful or differently prideful. Prideful is prideful. In fact, the people who have gotten this in my students are just so humble. They’re immediately humble. They’re like, “Oh my God, I can’t believe this. Could this really be for me? My whole life is changed. Wow! I can’t believe this.” Because if it’s real, it’s ego-transcendent. So, there’s no pride. TS: OK. One aspect of what you’ve been describing that hasn’t fully landed for me—I don’t fully understand it—has to do with the open-hearted part and the connection to the heart energy and a relational awareness. I’m not quite sure how that just unfolds naturally from what you’ve been describing through these pointers. LK: Yes. I mean, there’s a couple of pointers that would go to that. One of them I call “Ultimate Tonglen Practice,” where you actually practice the support of awareness within you and behind that—the other person. What it is is that from the heart-mind—right where we were when we dropped, we opened, we came back, and you said, “We’re in being.” So, you remain in being. The heart-mind comes online. It starts to be curious and creative and relating. You start to see from your heart. When I say “heart,” sometimes I talk about five hearts—although I didn’t write this in the book. The emotional heart would be on top. The physical heart would be on the left. On the right would be what I sometimes call “the safe place of the heart” or “the cave of the heart.” Then the heart chakra would be on the bottom. Touching all of those is a door or a portal—a heart space that actually opens up behind your back to awareness and opens up in front of you experientially to connect with others. It’s kind of the locale of the sense of heart-mind, which just perceives in a way that you’re not separate. The seeing from there is you’re not separate from other people. You see both the ignorance in yourself and the awakeness in yourself. You see the ignorance in others and the awakeness in others. That begins a whole different way of relating and listening. Your patience, your sense of —you don’t need to try to be more accepting. The natural condition of open-hearted awareness is [that] it already accepts what is. And yet, it can set a boundary if it needs to say no, because it’s not afraid to do that either. So, there’s a discriminating intelligence. There’s a discriminating wisdom. That’s the next move. So, many people haven’t come into the body—into what you were describing as “the ground of being” or remaining in being—and then abiding there. This is required. The stabilization requires the flow state—the functioning from there, from the heart-mind—and then the relational—and me dealing with emotional—often what I call emotions, conditioning. Liberation of karmic tendencies or dealing with internal parts of some personalities that try to sit in the seat of the self and try to get you to come back up top, [living] from your old parts. So, that’s kind of the last stage of this. That’s what makes it fully human. TS: Now, Loch, I could talk to you for a lot longer, and I hope we get many opportunities to do so. But, I want to end at least this installment in our conversation by just having you make something explicit—which I think has implicit—which is a vision that it seems that you have that people could become familiar with these pointers—this unlearning curriculum—and that we might see lots and lots and lots of people becoming spiritually awake and even stabilized in an accelerated way by doing so. So, I’m curious to know: what is this vision that you hold? LK: I mean, I think the vision—and that’s been my work for the last 20 years—is about how to simplify it, how to live it for myself, how to discuss with others who seem to have the same interests. What’s this? What’s that? How did you do this? What do you make of this? Then, internally playing with the contents of consciousness and this awareness. The sense is that, as the first teacher—well, not the first teacher. The first teacher was a guy, Doctor Chan in New York. But Tulku Urgyen basically said that—when I was eight years old, this was pointed out to me, and it’s no different [then] than it was now. He gave this out freely, and many others have as well. It’s the simplest teaching. The advanced teachings are the simplest. And yet, what I’ve done is looked at, “Now, what about not just the initial pointing and being passive or resting and trusting it will unfold—but now starting to familiarize and embody and intentionally live a life.” I’m living in New York City as a therapist who works with people. I went down there the day after 9/11 and [was] right in the middle of all this. That’s one of the reasons I’m here. Let’s see if it can be done in the middle of all this—with being married and being friends and working. There’s no doubt that it can. I have no doubt. How to organize that is probably the next thought that I’m having. I just thought this week, actually, that maybe I’ll try to find a hundred people who want to go through a year- or two-year program. We’ll just practice together. We can have retreats, and we’ll just test it out. People will report the results. Is it true or not true? I feel like I’ve tested it and I’ve gotten feedback from students enough that that’s why I wrote the book now. I waited until it was kind of cooked. I feel like it’s very possible. TS: I’ve been speaking with Loch Kelly. With Sounds True, he’s published an exciting and important and extremely thorough new book. It’s filled with dozens and dozens of what Loch Kelly has called in this conversation “pointers.” It’s really an incredible book. Shift into Freedom: The Science and Practice of Open-Hearted Awareness—a new book and a companion audio series. Loch, thank you so much for this conversation. Thank you for your years of effortless—shall I say—good work. LK: [Laughs.] Thank you so much, Tami. It’s a real pleasure.